As many you are aware, our favored Bordeaux grape varieties have fallen slightly out of favor with the current crop of California loving wine geeks. California pinot and syrah are the current flavors of the month and they show no signs of letting up. Was this a reaction to Sideways? Perhaps. More likely, I feel that sky high Napa Cab prices have driven consumers of quality wine to find alternative sources to get their fix. It also doesn’t hurt to be leading the trend and rubbing it in your friend’s face that you made a mailing list he missed, and oh... does he want to split YOUR allocation? (yeah, wine buyers can be a funny sort) That pettiness aside it is clear that wine enthusiasts are always on the look out for the next new thing so they can stay ahead of the curve. Buyers are fickle on the whole and like to feel special. Another Insignia is not going to cut it. I applaud everyone buying into the new pinot and syrah craze, but here I offer the NEW new thing. 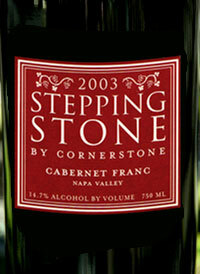 During our extended California tasting trip, Jen and I had some crazy good Cab Franc. As you know we focus on the Bordeaux varietals with a heavy emphasis on Cab, Merlot and blends. There were many outstanding wines in the bunch, but during the trip it be came apparent to us that the most interesting and well priced wines were the Cab Franc mono-varietals and “right bank” blends. Virtually all were priced reasonably due to the relatively unfashionable Cab Franc grape used. Hold on, I know what you’re thinking--a mouth full of green pepper and weed. To that I say, this not your father’s Cab Franc. The green pepper flavored Cab Franc of the Loire Valley and elsewhere have nothing in common with what California can do with the grape in the hands of good producer. They can get some serious ripeness in that valley and it makes all the difference. The wines are a touch spicy with ripe round fruit and interesting depth. These Francs had tons of character and interest. And let me tell you after tasting a bazillion wines that is a big factor in making a wine enjoyable. So drink up! Oh and get them before you friend does.